hi guys hows it going, just intressted to know how many uk members we have now. 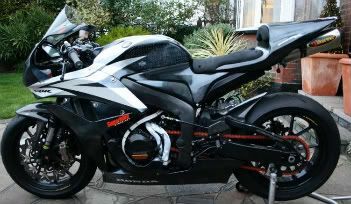 i reckon everyone should try and met up in the summer for our own 600rr.net trackday somewhere. Good idea, I'm planning one just a soon as the weather breaks, count me in. Have you been to the TT? Providing you put on a lil plate you'll get away with no other changes to yours as is. CBR 600RR 2007 Pearl Astral Orange was Pearl Sunbeam White. Too many mods too list. Im up for it too but would be my first track day ! Yeah I loved to, it would be my first track day aswell. I'd be interested too for sure. Donington or Oulton would be nice :icon_lol: but depends on what's available and everyone's preferences etc. Did the CBR forum trackday at Donington last year (as a Throttle Monkey) and it got a bit chaotic as so many had booked into whatever group had space irrespective of ability. Think the expected smaller numbers of our group would work better in that respect. you can put me down fo that ! id like something like that. Never been on a track with my bike so would defo be up for that. Any scottish guys fancy knockhill?? I could be up for that if sufficient people are interested to split into groups according to ability and to keep the cost acceptable. Guess a midlands track being fairly central will attract more. To anyone out there who has never done a track day it is the most exhilarating and yet safe way to ride a bike. I've only done one but absolutely brilliant fun. I bought my 07 in May and 1400 miles later did 3days on track in Spain in Nov . The last bike I owned was a Tigercub 50 years ago so it took me a while to get used to the gearchange on the left and the brake on the right!! Can't wait for summer I'm a fair weather biker. how much is a track for the day paul??? sticky'd the thread now. i'm going to get some dates together soon and we will start a proper list of people. wot month would everyone be thinking of? id be up for a track day. whats the realistic chance of binin my bike tho as i put a shed load of money into??? never done a a track day before? if you push to hard too soon then crash boom bang is likely! hi paul love the rr3 mate, where u get carbon intakes from? they real carbon?